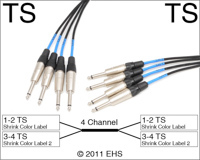 This is our custom-built TS (unbalanced) to TS (unbalanced) top quality 4 channel Mogami snake cable. You won't find a nicer snake anywhere. Construction is Neutrik TS 1/4" to Neutrik TS 1/4" with Mogami 2931 cable, fan-out wires with braided sleeve for protection, connectors with shrink tubing for color code and strain relief, and number label. Neutrik connectors are some of the best connectors around, with no screws to fall out after years of abuse. Mogami wire is (as far as I'm concerned) the best wire, used in the best studios for its ultimate sound qualities and durability. Mogami 2931 cable is very flexible, durable, heavy-weight cable. This is a low-Z or low impedance snake and is not intended for direct connection to hi-Z guitars and instruments (E.g., not for connection from guitar to amp). It will work but you may hear changes to the tone with longer snakes affecting it more.